I'll start by saying that I am the hardest person in the world to surprise. By nature, I plan everything...literally, everything. I can't help it. I get off from one of my "day-jobs" at 1:30 everyday, so when I pulled in the driveway Friday afternoon to find Rustin's car there, I was surprised, but mainly concerned. I am a pretty private person, I know that seems odd as I sit here and type out my engagement story on my public blog, but what I mean by that is that a photographer, a public place, surrounded by people, were things both Rustin and I had previously discussed and in his words, "this was our moment, no need for anyone else." As one of our favorite songs filled the house, roses everywhere to be seen, candles in every place they could be without setting the house ablaze, I knew something big was about to happen. I had never experienced surprise or shock as I did Friday. Shock that sets you back in this weird foggy daze; uncertainty, nervousness, and excitement all overcoming your body. As I followed the rose petals that led to the back room, I finally found my now, soon-to-be groom, standing with the biggest grin and the cutest bow tie waiting on me. He said all the right things and then got down on one knee. I of course said yes. 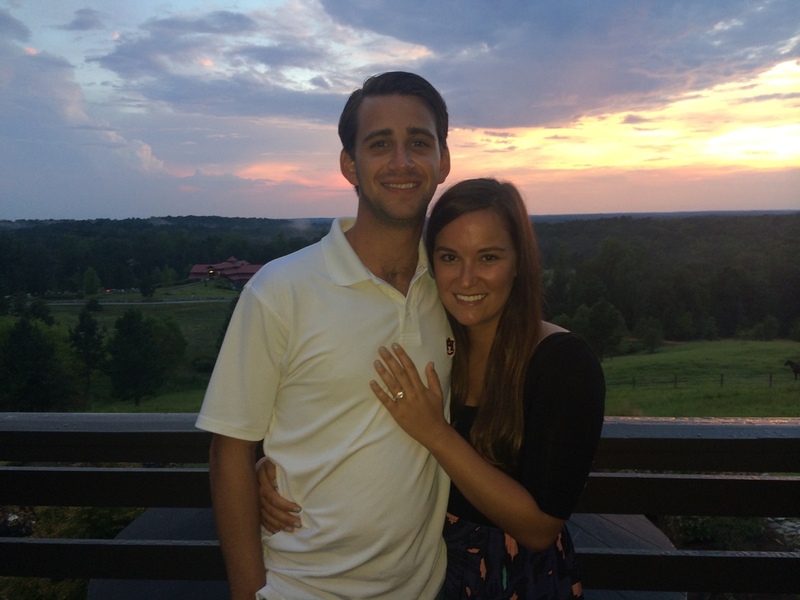 The picture above was taken the night after our engagement at our favorite restaurant on Lake Martin, where we spent celebrating with my parents and close family friends all weekend. Perfect cannot even begin to describe it all. RT, you nailed it. To my best friend, thank you for dealing with my every day idiosyncrasies that most people couldn't. These peculiarities you deal with will probably turn you into a canonized Saint by the end of your life. Thank you for pushing me to take that leap of faith that led to the beginning of this relationship several years ago, it was hands down the best decision I have ever made. I look forward to 60+ more years of laughing my way through life with you. You saved me. I saved you. Our story is certainly one for the books...here's to continuing to write it. I love you more than my words know how to explain. Until next time, I'M GETTING MARRIED!!! !